Instant Clone Technology allows administrators to rapidly clone and deploy a virtual machine in less time than it took for you to read these two sentences. Yes, that is one clone created per second on average. 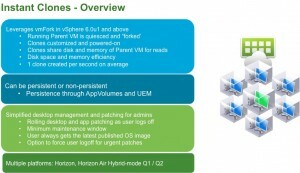 Instant Clone was one of the most exciting technologies introduced in VMware Horizon 7 earlier this year. Instant Clone technology works by “forking” a running parent virtual machine (VM) into cloned virtual desktops. These cloned virtual desktops share the disk and memory of the parent VM, which helps eliminate boot storms and reduced IOPS in virtual desktop environments. A patented technology that puts virtual desktops through a short customization period that does not require the rebooting of systems for the desktops to obtain their uniqueness, such as IP address or joining the domain. They can be powered on and ready to go once a user is entitled for access. This breakthrough technology allows administrators to clone and deploy VMware Horizon virtual desktops at a rapid pace—nearly one clone per second on average. This is great, because provisioning desktops can be the most time-consuming aspect of managing a VDI environment. Creating a desktop pool can be a lengthy process that includes cloning, re-configuring, customization and power on/off cycles that can take hours. With Instant Clone technology, the time involved is reduced to minutes, eliminating unnecessary steps needed to deliver desktops. Combined with VMware App Volumes for dynamic application delivery and VMware User Environment Manager for personalization, desktop administrators can have just-in-time desktops. Historically, other VDI environments, such as those powered by Citrix, haven’t been able to take advantage of Instant Clone technology. This is what makes Project Orion a very exciting innovation, since it enables XenDesktop customers to benefit from rapid desktop provisioning, faster login and less downtime. When combined with App Volumes and User Environment Manager, customers get the delivery of just-in-time desktops. Come see Project Orion for yourself in our booth (#520G) at Citrix Synergy in Las Vegas on May 24-26, where you’ll also have the opportunity to engage with the engineers who worked on the project. demonstrations of other VMware products that help optimize Citrix environments for real-time application delivery and user environment management, such as App Volumes and User Environment Manager.